Thank You for visiting LearnCFDs.com, a site focused on helping you get the most from your trading. Hi, I’m Ashley Jessen, and I built this site back in 2006 to help traders understand more about CFDs, Forex and useful trading ideas. Who am I and my trading background? I have been involved in trading the Australian stock market since the year 2000, which just happened to be the year of the famous Nasdaq stock market crash. 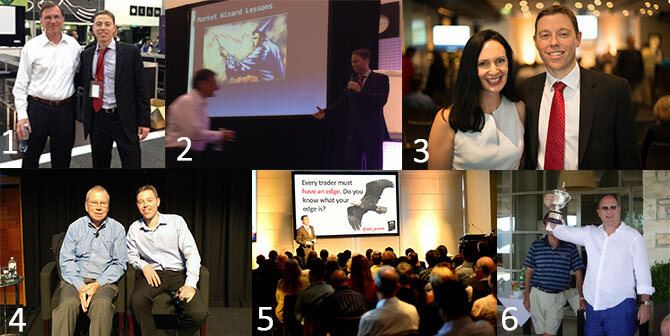 Since then I have conducted hundreds of seminars on trading strategies at trade shows, money expo’s, ATAA meetings and leading education companies. I have had the privilege of teaching thousands of traders safe and efficient trading techniques. Also, I have conducted over 300 one on one coaching sessions for traders to align their trading with their goals. From a trading point of view, I started off trading shares where my share trading was profitable. I attribute this to being surrounded by some great mentors like Max Lewis (Founder of the STANZ), Mike Sloan and Daniel Kertcher. I also read trading books ferociously. Below are a few pictures with some traders I admire. Got to chat to and meet Jack Schwager. He is such a humble and friendly person. It would be fair to say everyone thought he was genuine and wanted the best for their trading. I got to introduce Jack Schwager on stage in Melbourne a few years back. A picture with Louise Bedford. Her options trading book was instrumental for me back in 2001. John Bollinger presented in Sydney courtesy of CMC Markets. Presenting to 280 people in Sydney. Peter Cruddas (Founder of CMC Markets) beat me on the 18th hole to claim victory when we played Golf at his home course in the South of France. In 2001 I moved from trading shares to trading options. It’s the next logical step, right? In my first 4 options trades, I made every mistake possible. I had 2 wins, with one of them being over 100% in a couple of days, and I had 2 losses. I ended up the first week of options trading making $700 but I had a huge brokerage bill, so only cleared $450. It was a hectic week and I don’t think I’ve ever been as stressed. My options strategy at the time was to trade in multiples of three contracts. Take one-third off at 30%, next one off at 60% and let the last contract run. Hence why my brokerage bill was so high. I was trading with Rivkin Options Desk at the time. I studied Louise Bedford’s ‘Secret to Writing Options’ book for 6 solid months before I jumped into trading options. Then as I said, made ever mistake in the book in the first week. Incredible. Not even sure why I continued, to be honest. But I did. I ended up making some gains and also some big losses. One of my options losses was trading News Corp shares when they were about to write down the biggest corporate loss in Australia history. $8 billion. I thought for sure News Corp shares were going to tank and my put options were going to make me a fortune. Well, they did tank but they did it the few weeks leading up to the write-down. The massive loss had already been ‘priced in’. Now it was time for me to take my punishment. Not funny Jan.
News Corp shares gapped up massively on the open. I had lost about 85% of my put option position on the open. But I was a semi-mature options trader back then, so I had left plenty of time until expiry. So I held my nerve and stayed the course. After a few more weeks, my options position got back to breakeven and I bailed. In the end, I lost a little bit of brokerage. Phew. That was a close call. After more options trading disasters than I care to remember, I found CFDs. It was odd how they came about actually. At the time I was running educational courses for Metashare International, and a wealthy ‘off-shore’ type trader (from the UK) told me to open a CFD account. CFDs weren’t even in Australia and it could only be done through the UK. Shortly after his recommendation, CMC Markets launched in Sydney (Deal for Free back then), ran a trade show and I came across them there. So I made an appointment, went to their Sydney office and opened my first CFD trading account. CFDs were so much easier than options trading. I got access to the top 200 ASX stocks, commission free trading and I only needed 5% margin upfront. I no longer needed to worry about time decay, options strike prices or any other combination of complicated strategies. It was an exciting time. Shortly after I started trading CFDs, I resigned from full-time work and set up a private trading room in Bondi Junction, where we traded our funds using CFDs. I learnt quite a lot about what it takes to be successful trading the markets using CFDs. Very few people were trading Forex back in 2005, so I encouraged a handful of friends to open accounts and start trading Forex. A mentor of mine, now living in Majorca, was heavily into Forex systems trading. He suggested I jump on board a few systems he was trading. So we ended up trading multiple mechanical Forex systems, all with a positive expectancy. We learnt a lot during this period and I managed to make solid gains over a few months. 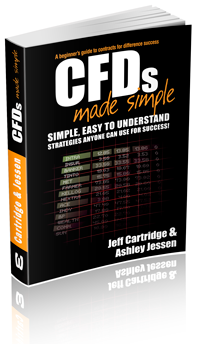 Together with my good friend and mentor, Jeff Cartridge, we wrote the book ‘CFDs Made Simple’, published by Wiley. CFDs Made Simple hit bookstores in 2011. I was so very excited to have a published book. Jeff and I also wrote a chapter in the Wiley Trading Guide Volume 2, titled ‘The Importance of Position Sizing – How to squeeze every possible advantage out of your current trading systems’. LearnCFDs.com is a culmination of what I have learned from trading shares, CFDs, Forex and everything in between. I love trading. Despite the time I have spent trading and learning from some of the trading greats I can assure you I am only touching the tip of the ‘trading’ iceberg. I am always learning and evaluating my trading ideas and methodologies just like you. LearnCFDs is a culmination of many years of live CFD trading experience, hours of personal coaching sessions and thousands of dollars spent on stock market educational courses and books. We’ve also got a number of handy video tutorials over at the LearnCFDs YouTube channel, so be sure to subscribe to it. A huge Thank You for visiting LearnCFDs.com and we wish you every trading success.